Jobs such as graphic design, architecture, and computer-aided design rely heavily on the mouse and have their own unique ergonomic issues. These jobs and others that require workers to spend countless hours in front of computers while barely ever changing position are a recipe for injury. Consider the following factors to help change poor work habits and reduce risk factors. The further you reach to hold and use the mouse, the more strain you place on your neck. There are alternative techniques and equipment that may help. Change your position to keep your elbows relaxed at your sides with the mouse directly in front of you, not to the side. For precision tasks, move the mouse from the wrist, not the fingers. For tasks not requiring as much precision, try to move the whole arm to avoid overuse. Make sure the mouse fits your hand. If it is too small, squeezing the mouse may cause hand cramping. This also places strain on your wrist and may cause pressure on the median nerve in the carpal tunnel. Remove watches or bracelets that interfere with movement. If you keep resting on your wrist, consider putting a thin gel pad under it for support. Adjust your cursor speed. If it is too fast, you will grip the mouse tighter to gain control. If it is too slow, you will repeatedly grasp and pick up the mouse to reposition it. A keyboard that has a detached number pad or one positioned on the left can help keep your elbows relaxed. If you need to do significant typing, simply slide the chair to center it in front of the keyboard. If your computer work requires you to draw, graphics tablets can help. These call for a more natural and relaxed position of the hand, wrist, and forearm. They also encourage healthier whole-arm movement and reduce contact pressure on the sensitive carpal tunnel. Once you are used to graphics tablets, they offer increased control and precision. Choose the smallest tablet that lets you comfortably do your job. A second trackball or mouse on the left of the keyboard allows you to give your right arm a break. Use the secondary device for e-mail, navigating documents and the Internet, and other non-precision tasks. Center the screen in front of you. If you use two monitors and use each screen equally, place them so you are seated where they meet in the middle, so you look to the left and to the right equally. If you use one monitor more than the other, place the primary monitor centered in front of you and the secondary monitor directly next to it, slightly angled toward you. The screen should be about an arm’s length away. Place the top line of the glass of the monitor at eye level. If you use bifocals, lower the screen slightly until your head is level and you are not looking upward. To reduce eye strain, adjust the brightness and contrast controls, as well as the ambient room light, to make them equal. Avoid glare. Place the monitor perpendicular to windows or draw the blinds. A glare filter can also help. Take the time to adjust the chair to fit you. If you have neck or shoulder discomfort, raise the armrest of your chair to support your forearm without pushing the shoulder toward the ear. The ideal chair for these types of jobs places you in an upright posture and encourages fullarm movement. A pear-shaped back design provides spinal support while freeing your shoulder blade and arm to move properly. 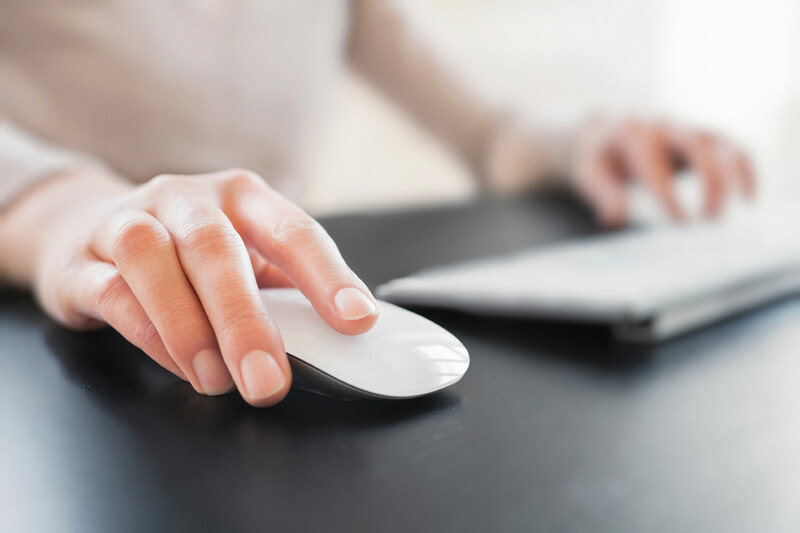 If you continue to experience pain or discomfort while using a mouse, talk to your doctor of chiropractic and consider having an on-site ergonomic evaluation. To work properly, muscles need a break to rid themselves of lactic acid and waste products while delivering oxygen to the tissues to prevent overuse and damage. Take 15-second micro-breaks each hour. During the breaks, shake out your arms and stretch your wrists. Computer users should also frequently look away from their screen and focus on something about 20 feet away. This allows a break for the eye muscles. If you’re concerned about taking too many breaks, spread out tasks such as walking to the fax and copier, returning phone calls and meeting with co-workers throughout the day.